In a move meant to appeal to consumers who want fresher fare, Kraft Heinz is investing in foods that are sold in the refrigerated perimeter section of the grocery store. 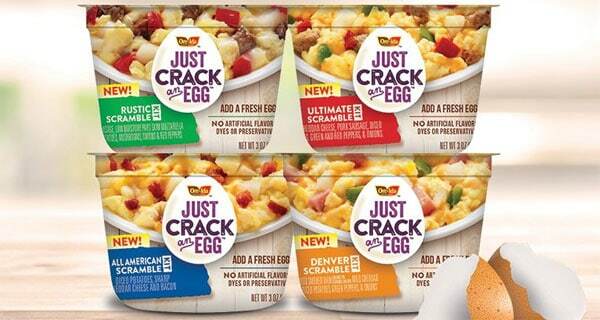 The 3G-backed packaged goods giant has launched a new brand called Just Crack an Egg — an individual serving-sized cup comprised of diced vegetables, breakfast meat, cheese, and potatoes. The product requires that consumers stir in a fresh egg (not included) and cook it in the microwave. With Just Crack an Egg — available in four varieties — Kraft Heinz is trying to play on some of the major trends in the food sector, including consumers’ desire for convenience and less-processed goods. The ingredients in the cups have no artificial flavours, dyes, or preservatives, and will sit in the refrigerated section of supermarket near the eggs. “It’s a new shelf space for Kraft Heinz to play,” Guidotti explains. The move into the refrigerated section is part of a broad push by consumer packaged food companies to get their products into the perimeter of the supermarket, which has experienced more growth as consumers move away from the processed and packaged fare that tends to live in the centre of the store. “Fresh prepared foods could continue to crowd out floor space for shelf-stable foods,” Bernstein analyst Alexia Howard predicted in a recent note. Campbell Soup CEO Denise Morrison has termed the new category “packaged fresh” and estimates that it’s a $19-billion proposition. Campbell has made big investments here, especially with its Bolthouse brand — albeit with some stumbles. In January, Campbell Soup’s Bolthouse Farms announced a new type of refrigerated, eggless, yogurt-based spreads called Maio meant to be a “clean” alternative to mayo. And just last week, PepsiCo announced its subsidiary, Naked Juice, was launching a new line of chilled fruit, nut and veggie bars. Guidotti says that Kraft Heinz tested a myriad of different propositions for the product, including an already-prepared egg that could be heated up in the microwave. But having the consumer add the egg “delivered on the fresh cue” that consumers are seeking, he explains. With the new product, Kraft Heinz is also capitalising on its existing brands: Oscar Mayer for the meat, Kraft for the cheese, and Ore-Ida for the potatoes. Guidotti says the company decided to launch a new brand rather than build off an existing one in part because the company sees Just Crack an Egg as a “platform” rather than a single product. Capitalising on two powerful trends right now, convenience and fresh foods, Kraft Heinz appears poised to be a disruptor in the breakfast space. By selling its newest product next to the eggs section, the food giant further reinforces the product’s fresh positioning and makes the breakfast scramble appear less processed. In many ways, this product seems to hit on today’s top consumer demands. Shoppers don’t have a lot of time in the morning, which typically translates into grabbing a bar or juice before racing out the door. This egg scramble takes less than two minutes to make, and offers a protein-loaded alternative to the typical carb-heavy fast options.